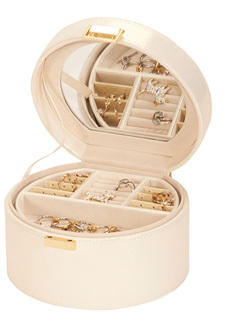 Beautiful jewellery deserves to be stored safely away in a box just as beautiful. And we’ve found some gorgeous accessory boxes at Mele & Co.With savings of up to 62%, there are some real bargains to be had. Down to just £10, the Belinda Box is a black leather case with cream interior compartments – the perfect size for all your most-precious pieces. The Inola GoldenPearl Box (left) oozes luxury. The circular case has a pearl finish and a huge mirror hidden in the underside of the lid. Reduced from £40 to £22, it’s an amazing deal. Go to Mele & Co and check out their collection.